Hypericum is used for injuries to nerve rich areas and the spine. It acts as a painkiller for injuries to parts rich in nerves (Ledum). For sharp, shooting nerve pains. Pain is shooting upward, along the nerve. Ailments from punctured wounds, lacerations, bites of animals. 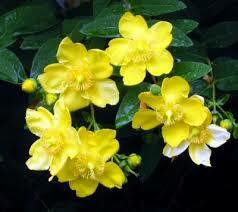 Hypericum is very helpful for toothaches, injury or trauma to the teeth. Use it for ailments after dental procedures. Use before and after dental procedures or dental surgery. Back injuries to spine, coccyx (Sil). Pain shoots up the spine and down limbs. Injuries to finger tips or toes. Needle or splinter, under nail, in finger or foot sole (Ledum). Convulsions after injury, esp. to spine, head (Nat-s). In women, it is very useful for after-pains after instrumental delivery in childbirth and for a bruised coccyx after labor. from Materia Poetica by Sylvia Chatroux, M.D.